2018 California Instructional Materials Adoption for Science – SELECTED! Meets the Integrated Model criteria from the California Department of Education. experience, investigate, model, and explain interesting phenomena. engage with concepts that cross disciplinary boundaries. Students’ original questions are elicited by an anchoring phenomenon and drive the storyline. Students strive to find answers to authentic questions that motivate learning across time. Students’ diverse, everyday experiences are interwoven into every lesson. Small-group and whole-group discussion are central to every investigation. A Driving Question Board™ and Word Wall give students multiple opportunities use the language of science and to track their learning visually. make sense of in-class science, everyday experiences, and the larger world. Students revise and build on ideas across time as they develop, reinforce, and apply their understandings. Phenomena driven: Students experience phenomena firsthand where possible, secondhand where not possible, but always so that the goal of science learning is to be able to explain phenomena—to explain how and why things in the natural world happen as they do. Coherent: Students build understanding through a progression within each grade level and across grade levels, learning critical Disciplinary Core Ideas, Crosscutting Concepts, and Science and Engineering Practices across content areas and grades. Curricular coherence—revising and building on ideas across time—provides students with opportunities to develop, reinforce, and apply their understandings on an ongoing basis throughout their middle school years. Three dimensional: Every lesson engages students in one or more Practices and one or more Crosscutting Concepts, as student understanding of core ideas builds so that they are poised to meet every CA NGSS standard over time. For teacher planning purposes, PEs are called out at the beginning of IQWST lessons, and all three components of 3D learning are called out at the beginning of each lesson’s activities. Disciplinary Core Ideas are typically addressed in multiple lessons, with the aim of developing depth of understanding rather than simply achieving coverage. Scientific practices are used singly or in combination, so that students engage meaningfully in the work of scientists as they explore and learn core ideas. Crosscutting Concepts thread throughout the curriculum, repeatedly revisited so that students construct deep understanding of the ideas as they apply to each science discipline. Student centered: Students’ original questions are at the core of the curriculum, elicited by an anchoring phenomenon on day one or two and throughout each module, setting them on a quest to find answers to authentic questions that motivate learning across time. Discourse centered: Combining small-group and whole-group discussion in every lesson, with talk supported by tools such as a Driving Question Board, a Word Wall, and others, students have multiple opportunities to hear and to use the language of science. Talk is used as a way to share ideas, to think together, to problem solve, and to make sense of in-class science, everyday experiences, and the larger world. For all: IQWST engages all students with shared phenomena, common investigations, and opportunities to draw upon and connect their everyday life experiences with science content. As students read, write, and talk about their experiences in a language-rich environment, every student has the opportunity to achieve success in STEM. Brief descriptions of related engineering careers are interwoven with each engineering design activity in the SE, and biographies of diverse scientists and engineers, available on the Student Portal, enable students to see the career paths that people who may be “like themselves” have taken, providing evidence that everyone has the potential to succeed in STEM. 6.1 What Is Going On Inside Me? This module focuses on the body as a system made up of subsystems, with all parts working together to perform various functions and interacting with the environment. Students’ individual questions about what happens inside their bodies to enable them to do the many types of activities that they enjoy motivate the investigation of various body systems and the role each plays in overall body function. Pursuing their questions avoids the traditional treatment of body systems in which systems are presented one after another, with the details of structure and function the highlight rather than how systems work, work together, how matter and energy flow through the body, and between the body and the environment around us (i.e., how the outside temperatures makes our bodies feel hot or cold). The module focuses on what happens to food and oxygen that enables the body to meet its energy needs as food is eaten and ultimately transported to cells throughout the body. Exploration begins, then, with cells. Tracing the transformation of food to usable energy at the cellular level raises questions about how this happens. By the end of the module, students are able to construct a detailed, evidence-based, grade-level appropriate explanation of what goes on in their bodies to enable them to do an activity they enjoy. The specifics of cellular respiration are in 7th grade. 6.2 Why is It so Challenging to Predict the Weather? This module focuses on what causes variations in local weather events and global climate patterns. Students investigate the flow of matter and energy throughout the atmosphere and between them and the air around them, and they develop models of processes such as conduction and convection. The module focuses on the movement of matter (air and water), and the role that energy plays in that movement. Students create models of what causes weather to change. By looking at weather as yet another complex system made up of sub-systems, students are able to construct an explanation for why predicting the weather is challenging. Additional standards related to temperature/thermal energy and to the particle nature of all matter are further built upon in 7th and 8th grades. 6.3 Why Do Organisms Look the Way they Do? This module focuses on heredity, and how traits pass from one generation to the next in both plants and animals, including humans. The organizing theme is comparing organisms; students investigate what makes them similar or different, and develop a model of inheritance to help them understand heredity. They then use the model of inheritance to explain and predict phenomena. Given that organisms need to reproduce in order to pass on their traits, the module also explores structures and behaviors of some organisms that enable them to reproduce. This module builds foundational knowledge and explores underlying mechanisms for inherited traits that is built on when investigating populations and change over time in 8th grade. 6.4 How Do Humans Affect the Earth Around Us? This module focuses on energy transfer as a mechanism for understanding issues related to global warming and climate change and the effects that humans have on both. Using land, water, air, and organisms as focal points, the module investigates how humans have impacted those components of the Earth system. Students analyze a human-impact problem and design solutions to minimize its effects, and they consider the consequences of those designs for Earth and its inhabitants. Once encountered here, climate change is able to be addressed in future modules, including its importance in sustainability, addressed in 8th grade. 7.1 What Makes Up Earth’s Natural Resources? This module focuses on two overarching ideas: 1) Planet Earth is made up of natural resources that humans rely on and use in a variety of ways, and 2) Each of these resources, regardless of state of matter, is made up of atoms, joined together in particular configurations called molecules. Students explore key concepts, especially the particle nature of matter, in the context of both physical and Earth sciences. Students first investigate air, modeling odors traveling in air, and then generalize their models to all gases. Over time and through investigations, they revise and generalize their model to include liquids and solids, all of Earth’s natural resources, and all matter. In an engineering-focused lesson, students investigate fossil fuels derived from those resources. While students come to this module with a general, macro-level understanding of air as made up of molecules (from 6th grade), they learn what it means to be “made up of” molecules, and for molecules to be made up of atoms. The foundational understanding of the particle nature of all matter is built upon in all modules that follow this one. 7.2 How Can I Make New Substances from Old Substances? This module is a project-based module that builds on core science concepts such as the particle nature of matter, and substances and their properties, with emphasis on students designing investigations and figuring out and explaining phenomena. Students investigate what it means to make new substances (products) from old substances (reactants) via chemical reactions. Students make soap from fat, make a bioplastic from cornstarch, and engage in several investigations that include molecular modeling experiences that support them in developing a deeper, molecular understanding of phase changes, mixtures, and chemical reactions. The core science concepts explored in the module—especially those related to matter and its interactions and to energy—are instrumental in modules that follow, and for future science learning. 7.3 What Do I Have in Common with Planet Earth? This module explores aspects of the human system (the body) and Earth systems (large-scale changes on Earth) in a manner that enables students to ultimately determine that these two seemingly unrelated entities have important things in common, especially that both are dynamic (changing) systems through which matter cycles and energy flows. The module deepens students’ understanding of several key concepts that they have investigated in 6th and 7th grades. They especially focus on molecular aspects of how food provides organisms with energy and building blocks for growth and repair; the chemical reactions and energy transformations that occur during photosynthesis and cellular respiration; the biological processes that support these processes; the interdependence of organisms and organisms and their environment; and the changing around us (including plate tectonics). 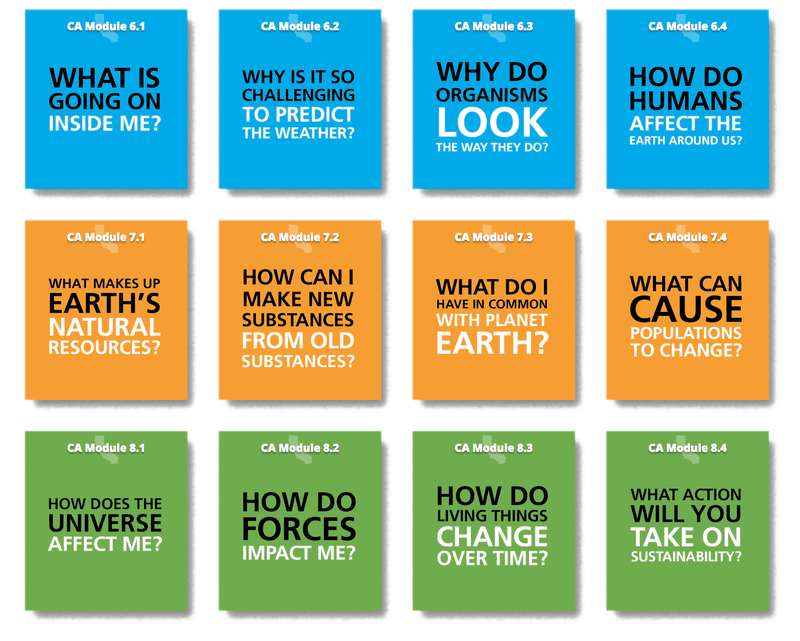 The module culminates in students being able to answer the Driving Question with a complete, evidence-based explanation that draws connections among Earth and human systems as dynamic and always interrelated, a big idea that informs future learning. 7.4 What Can Cause Populations to Change? This module is a project-based module that builds on students’ earlier explanation of natural resources—the water, atmosphere, and land around us. In this module, they continue investigating the biosphere, building understanding of how organisms depend on each other as well as how they can be affected by events that disrupt ecosystem function. This module focuses on organisms’ needs for survival, what happens when those needs are not met, and how humans can act to mitigate changes. Over the course of the module, students will learn more about why food is important (building on what they learned about the body in 6th grade and about food at the molecular level in the previous module), investigate why different structures are needed and how they are used by organisms to eat and reproduce, and investigate relationships between organisms (e.g., predator/prey, producer/consumer, parasite/ host, and competition). As they work to solve a mystery in which they investigate an invasive species, students will also investigate abiotic factors that affect ecosystems. The module concludes with two engineering-themed activities in which students explore ways that humans can participate in solving ecosystem problems. Students engage in a group or independent research project in which they apply everything they have learned either to problems caused by a local invasive species or to another local environmental problem, and consider how it might be solved. The research project lays the groundwork for more extensive research on human/ Earth interaction and interrelatedness to be done in 8th grade. 8.1 How Does the Universe Affect Me? This module begins with a focus on the forces that formed the universe, and Earth’s solar system, from chaos. Students explore the big bang theory, and the role of gravity as the major force that continues to operate and maintain order in the universe, enabling us to observe predictable patterns in the Earth-sun-moon system. Students then investigate the role that light, in particular, plays in how we observe objects in our solar system, and then shift to the many other important roles that light plays in life on Earth. The scientific principles that explain the behavior of light are the principles that govern much of the behavior of cellular phones, computers, MRI scanners, microwave ovens, nuclear power plants, televisions, satellite communication, GPS, and many other systems. Nearly all the major scientific discoveries and major technological advances made in the last 100 years are based, directly or indirectly, on principles underlying the behavior of light. It is impossible to make sense—scientifically—of the world in which we live without understanding how light propagates and how it interacts with matter. Students are introduced to the electromagnetic spectrum and exploration of the role of visible light in allowing them to examine the universe, and to the role of nonvisible light that has advanced technology. Some students are likely to addresses technological advances in their Module 8.4 projects. 8.2 How Do Forces Impact Me? This module contextualizes concepts dealing with force, motion, and energy in students’ real-world experiences. Four interesting devices provide a common experience for all students to begin investigation of force and motion in the larger universe and in the world at their fingertips, and later lessons circle back to making sense of the anchoring phenomenon. This practice of exploring, asking questions, and then continuing to revisit—each time knowing a little more of the science of what is happening—enables students to learn core ideas that explain a range of phenomena in the real world about how things start, continue, and stop moving. An engineering design activity provides an opportunity to apply and to develop deeper conceptual understanding of particular types of force. 8.3 How Do Living Things Change Over Time? This module is organized around three clusters of ideas: variation within and between species as a result of natural selection, the effects of natural selection over geologic time periods, and the geologic processes that have affected Earth throughout Earth’s history. These important ideas, from different fields of science, provide data that scientists have assembled as evidence of how change over time has occurred. The module focuses on developing models in both life and Earth sciences, and applying them consistently. The application of these models, throughout history, elucidates the story of evolution. The module concludes with a look at human intervention in population change in the form of selective breeding and genetic modification of plants and animals, which some students will likely choose to carry over into Module 8.4 projects. 8.4 On What Issues of Sustainability Will You Take Action? This module synthesizes learning of DCIs, SEPs, and CCCs addressed throughout middle school. In 6th and 7th grades, students investigated Earth and human systems as they continuously, and over time, impact one another. In 8th grade, students have learned about how the Earth and biosystems began, and the processes that enable these systems to continue to operate, and how they may be considered a basis for predicting future events. In this module, students reflect on the role of humans in maintaining the balance and sustainability of Earth’s systems, considering closely: “All human activity draws on natural resources and has both short- and long-term consequences, positive as well as negative, for the health of people and the natural environment.” Students choose a topic that has interested them at any time during middle school, and in which they have passionate interest, and they examine related issues that threaten sustainability, ultimately developing an action plan for change that begins with their own actions. The goal for this end-of-middle-school module is for students to develop an evidence-based argument to explain how direct and indirect changes to natural systems, due to issues related to human interaction (including population growth and increased consumption), influences those natural systems, and how they can be an agent for change. Part of the intellectual richness and rigor of IQWST ® is in the challenge it provides as students connect ideas across modules. The integrated version of IQWST provides a unique opportunity to implement storylines in two ways. First, IQWST’s storyline approach has always been to use a Driving Question as the module title as well as the project or problem around which each module is built. That is, students build understanding of DCIs, CCCs, and SEPs in a coherent manner from one lesson to the next, with each activity ending with a new question or a not-yet-solved problem that is addressed in the following activity. Hence, from a student perspective, a story is built from lesson to lesson within each module, with the aim of answering the Driving Question as a complete, evidence-based explanation. The unique opportunity that the integrated version provides is for implementation of a yearlong storyline that enables students at each grade level to connect one module to another across the school year. And while all CCCs, SEPs, and specified DCIs and PEs are addressed in various modules, systems and interactions is a theme across all of middle school, connecting one module to another to another within and across grade levels, and supporting students’ understanding of systems in a coherent manner. The storylines described below are written from a student perspective. The broad storylines provide shape for each school year and, along with the transition ideas, help illuminate the rationale and vision for the curriculum sequence in the IQWST Integrated Edition. The transition statements provide language you may use with students (altered as you wish) to build a story from module to module within each grade level and from one year to the next. This kind of connection, and the coherence already built into the modules, helps students maintain a conceptual thread over time. That way, each module is seen not as a separate topic, distinct from those before and after it, but as part of an entire middle school learning experience in which building understanding and connecting ideas is at the foundation of the science curriculum. Broad storyline: All organisms (including me) are systems that are part of even larger systems; these systems all interact with and affect each other in important ways. 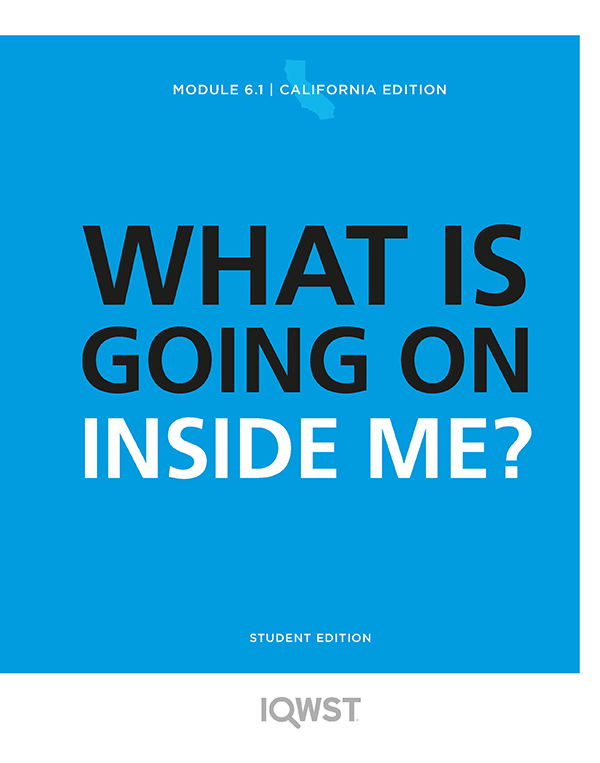 Module 6.1: What is Going on Inside Me? 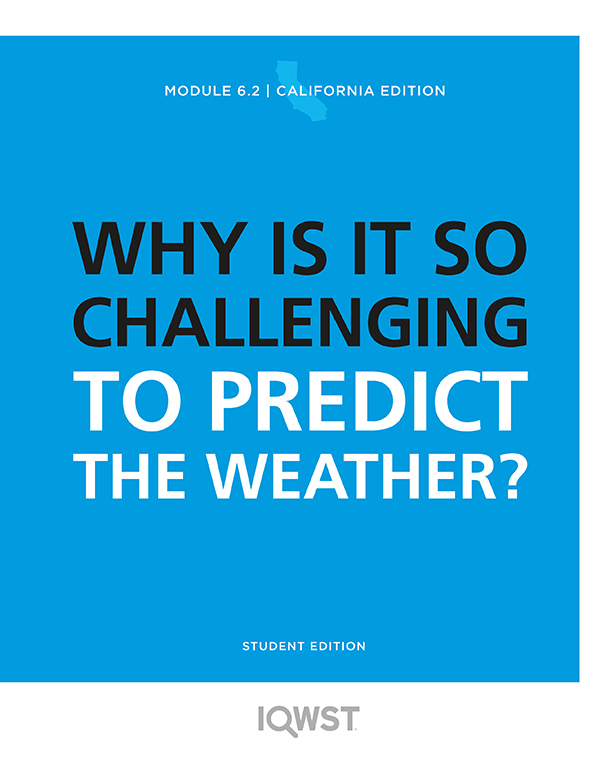 Module 6.2: Why is It So Challenging to Predict the Weather? 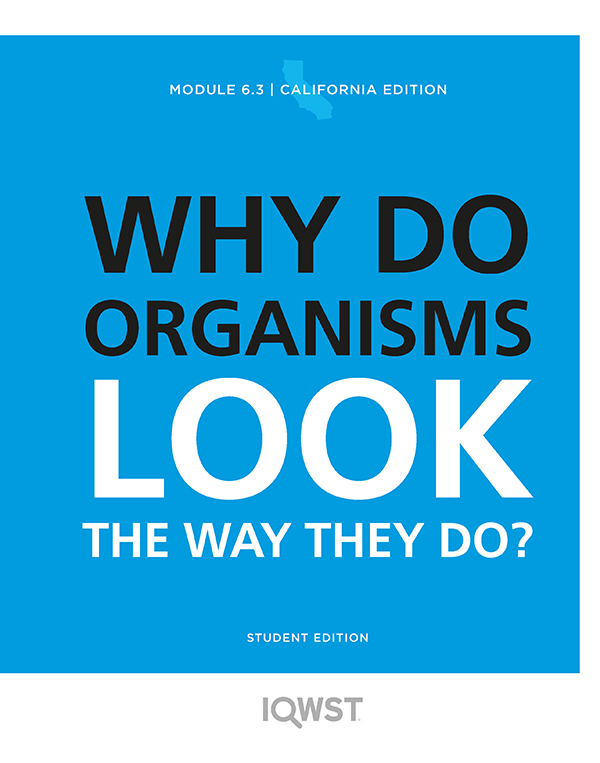 Module 6.3: Why Do Organisms Look the Way they Do? 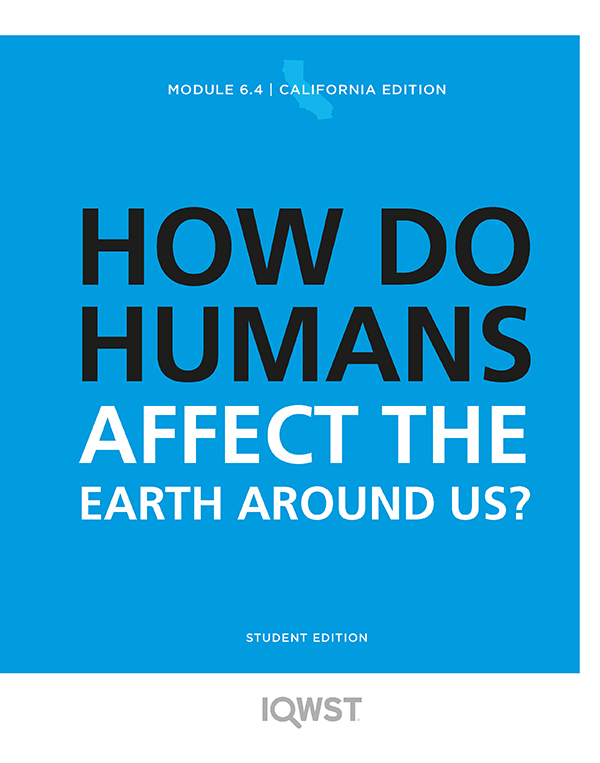 Module 6.4: How Do Humans Affect the Earth Around Us? From Module 6.1 to 6.2: Our bodies are systems made up of systems—and every day we live and operate in systems all around us that affect us in different and important ways. For example, we are directly affected by the system all around us that creates the weather. How does weather affect us? What makes different kinds of weather happen? From Module 6.2 to 6.3: We’ve looked at an important system around us that affects us every day. What factors that are inside us affect each of us? For example, what factors affect who you are and what you look like? Do you think that the environmental affects who you are and what you look like? From Module 6.3 to 6.4: We’ve spent the year so far talking about different types of systems and how they affect us (and other organisms). Let’s end the year thinking about a different way of looking at interactions: What effects do we have on systems around us? Broad storyline: Both natural processes and human activities cause energy to flow and matter to cycle throughout Earth’s systems, both systems around us and systems in us, and we have the ability to make changes in some of those systems. 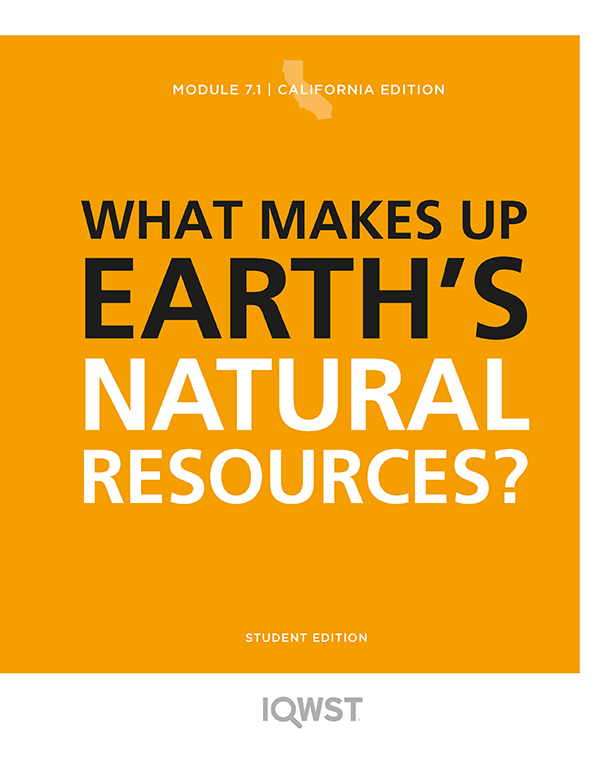 Module 7.1 What Makes Up Earth’s Natural Resources? 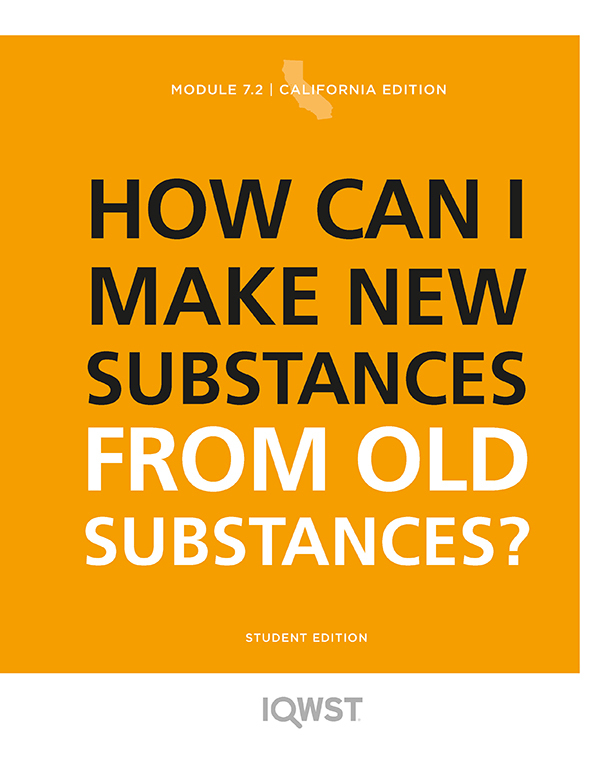 Module 7.2 How Can I Make New Substances from Old Substances? 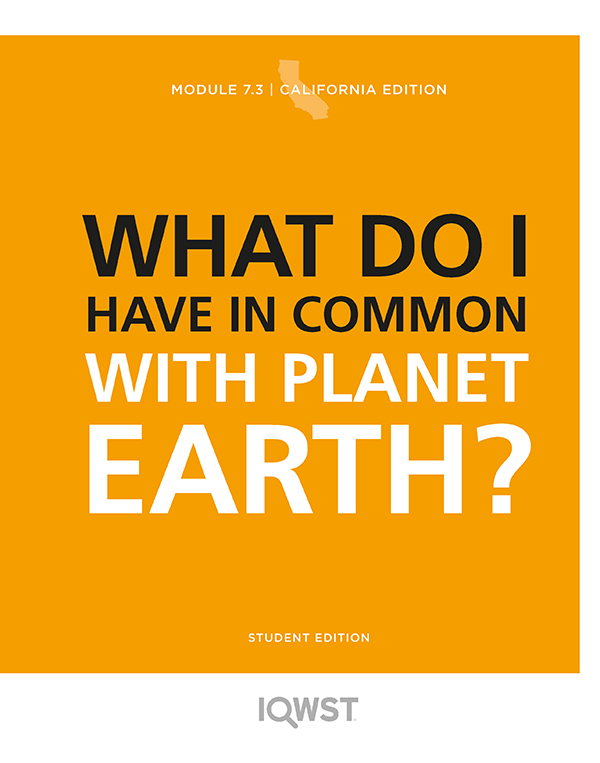 Module 7.3 What Do I Have in Common with Planet Earth? 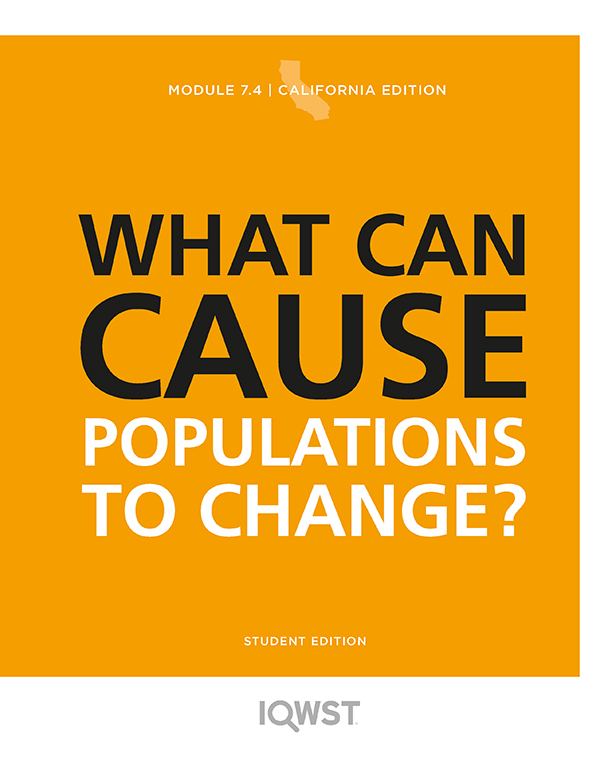 Module 7.4 What Can Cause Population Change? From 6th grade to 7th grade: In 6th grade, you investigated what makes the human body a system, and you spent the year looking at humans as part of many nesting systems that all interact with each other. This year, we’re going to look much, much more closely at the interactions within those systems. Let’s start with a very basic question: What kinds of things do we need to stay alive on Earth? From Module 7.1 to 7.2: Now that we’ve looked at what we need to stay alive, looked at natural resources up close enough to give us evidence that everything on Earth is made up of atoms and molecules, what do scientists do with their understanding of atoms and molecules? Why is it important? How does that understanding help us in any way? From Module 7.2 to 7.3: Now that we understand chemical reactions as a way to use our understanding of atoms and molecules to change starting substances into new products, what other ways do things on Earth change? How does the Earth change without us doing anything? How do we change? Do chemical reactions have anything to do with changes in us or around us? From Module 7.3 to 7.4: We’ve spent the year so far talking about different types of Earth systems and body systems as well as the changes in both of the systems, including investigating how matter and energy flow between systems. Besides the changes we’ve already talked about, what other ways do things on Earth change? What else can happen to cause changes in the environment, for example? How about between organisms and their environment (ecosystems)? Broad storyline: We are part of a large universe that affects us on a large scale as well as a much smaller scale, and is governed by principles that have affected Earth and life on Earth across time. We also play a part in what happens to the planet and to the organisms that make Earth our home. 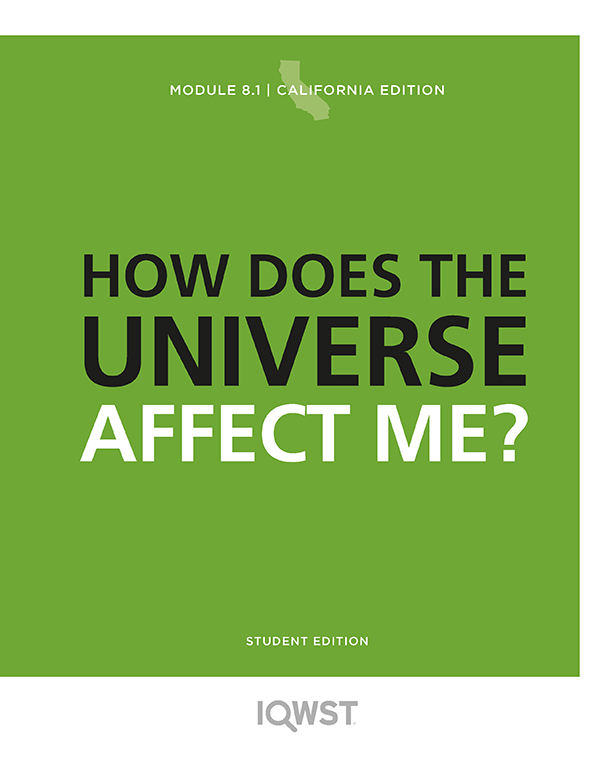 Module 8.1 How Does the Universe Affect Me? 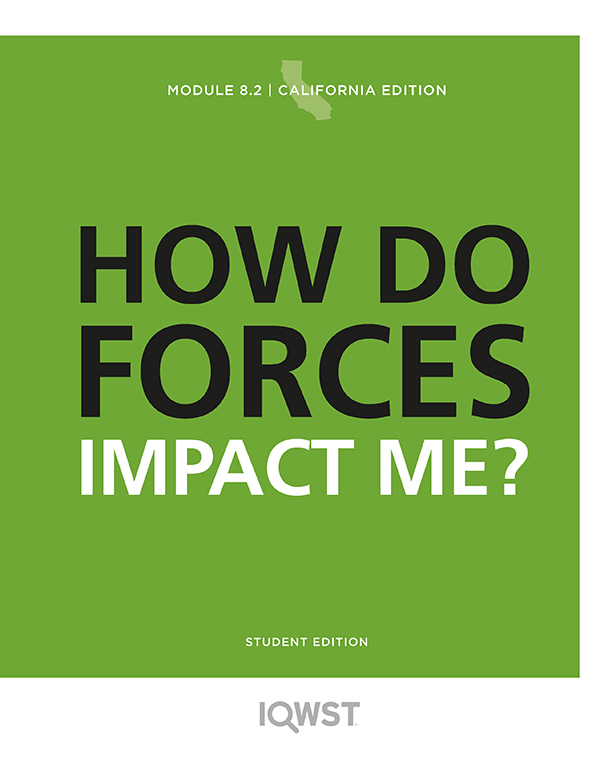 Module 8.2 How Do Forces Impact Me? 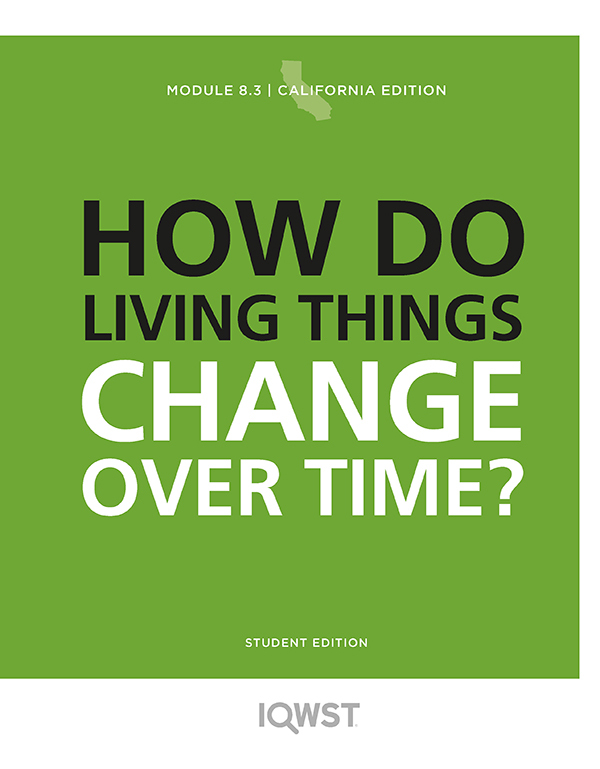 Module 8.3 How Do Living Things Change Over Time? 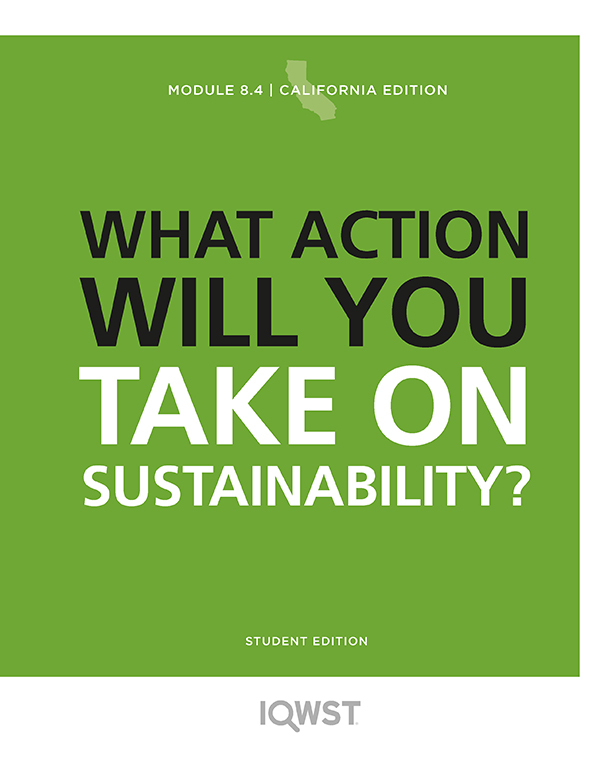 Module 8.4 On What Issues of Sustainability Will You Take Action? 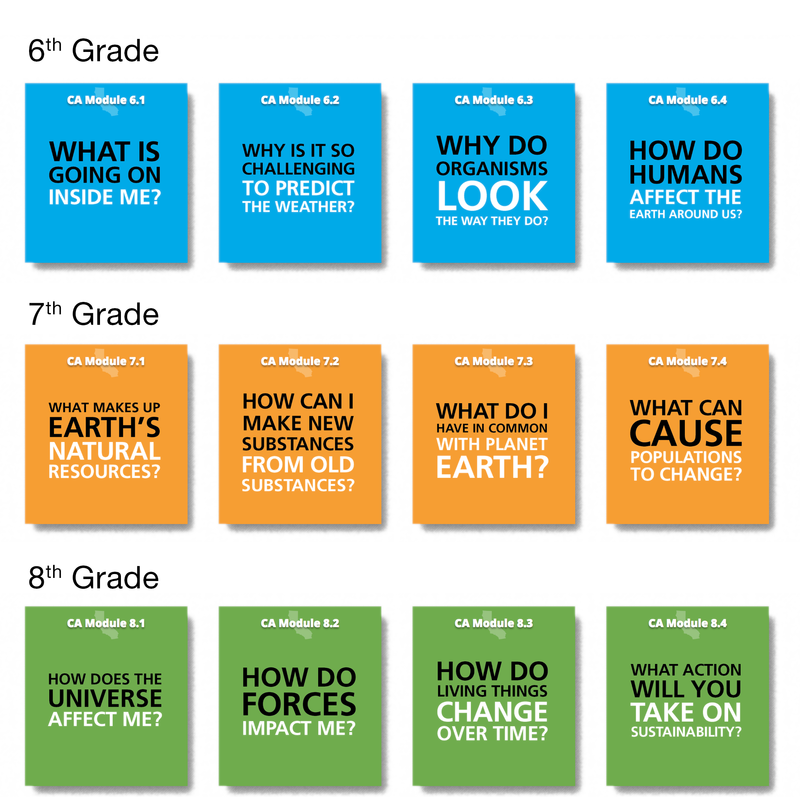 From 7th to 8th grade: So far in middle school, you've learned about interactions between many types of systems. We’re going to start this year by investigating systems of very different sizes and scales, learn more about what makes something a system, and learn more about what drives interactions within and between systems. Some important (and big!) processes changed Earth’s systems in the past, and many of those still affect Earth today. What do you know about how Earth became a planet? How do any of those same processes affect us now? From Module 8.1 to 8.2: Now that we've investigated some very large-scale processes in the universe, and we've looked up close at how important light is everywhere, including in how we see things directly around us, what other processes that affect the universe affect us as people living on planet Earth? From Module 8.2 to 8.3: We’ve seen that processes that began the universe and our solar system long ago and other processes that happen around and in us as we sit in our desks continue to affect us and other organisms on Earth. How do scientists figure out what happened in the past and whether those processes will continue in the future? From Module 8.3 to 8.4: You've studied plants and animals; you've studied the history of Earth; you've studied laws that govern how things work, and theories that describe how things work; you've studied interactions among all kinds of systems; you've read about scientists in history and modern scientists, and you've asked lots and lots of questions about how and why things work like they do. Based on all you've learned so far, we're now going to look at what we can do to keep all the systems working that enable us to live and to live on this planet. What can we do to affect processes and changes on Earth? What can we do collectively? What can you do as one person? What is Going on Inside Me? Why is It So Challenging to Predict the Weather? Why Do Organisms Look the Way they Do? How Do Humans Affect the Earth Around Us? What Makes Up Earth’s Natural Resources? How Can I Make New Substances from Old Substances? What Do I Have in Common with Planet Earth? What Can Cause Population Change? The primary goal of IQWST® IDE is to provide teachers and students with a digital option for a discourse-based classroom. Although both the TE and the SE are available entirely in digital format, some teachers still choose to use a print TE along with their digital materials. The IDE is not the same as pdfs on the Portal (which are also available). All PIs are projected from the IDE. Reading students’ written responses and providing written feedback is done through the IDE. Points or grades you choose to apply to students’ work are assigned using the IDE. IQWST IDE expands the ways in which students are able to engage with science as it incorporates audio, video, graphic simulations, and writing and drawing tools into the curriculum. 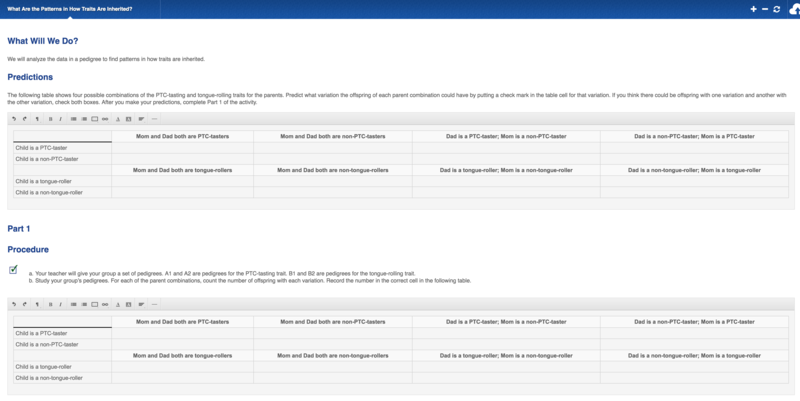 Test bank from which to choose and edit assessment items, to create your own items, and to create assessments that combine items in the test bank with your own original items. Assessments may easily be shared with colleagues also using IDE. Videos for using the IDE are provided for teachers as new features are added.